Chinese actress, Gao Yuan Yuan (高圓圓) walked the red carpet Grazia 100th issue celebration party held at Shanghai Shallow Water Bay Culture Center on December 21, 2012. 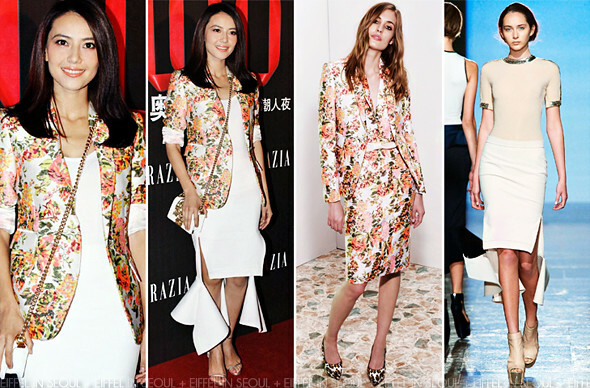 The actress opted for a floral printed blazer from Stella McCartney Resort 2013 collection, a Uniqlo white tank and a fish-tail sculptured skirt from Masha Ma Spring/Summer 2013 collection. Alexander Wang 'Fabiana' metallic sandals and Chanel 'Le Boy' shoulder bag to complete her look. While I don't fancy the skirt (it looks messy), this outfit is chic.